Purpose - to pursue the church’s Mission to help those suffering from hunger and deprivation. We favour schemes where the Parish has personal links – the funds can be channeled direct and we know how the money is spent. In recent years much of our fund has been allocated to the Courier Orphan Fund in South Africa. Virginia Carlton passes the funds to the volunteer managers and monitors their use: this is mainly feeding programmes, shoes and other essentials for AIDS orphans. 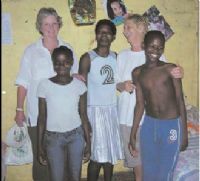 See a report on the success of one of these projects Rose Swane's Safe Haven; she is very proud of the outstanding matric results achieved by some of her orphans. Fr Richard was impressed by her work when he visited last year and Virginia will be meeting her again shortly. At home we have contributed to such causes as the Samaritans at Hereford, Crisis at Christmas, and the Passage at Westminster (the Catholic project providing support for the homeless. Recently contributions from parishioners have dropped off and we need more support. The method is simple: envelopes labelled “Parish Project” are available at the back of the Church and donations, large or small, regular or from time to time, can be placed in the collection plate. It is part of the Church’s Mission to help those suffering from hunger and deprivation. The Parish Project is the means by which the Parish as a whole has the opportunity to share in this mission. Since it began 15 years ago the Project has channelled around £24,000 to carefully selected schemes, largely in places abroad where people are poorest and the need greatest. The funds accrue from regular or occasional contributions from parishioners. Envelopes are available at the back of the church for this purpose. We hope all parishioners will consider whether they can support the parish mission in this way. Samaritans Hereford - £300. It is a sad fact that their help is particularly in demand in the Christmas period, and financial support has fallen off recently. The Passage Westminster - £200. Founded by Cardinal Basil Hume to help homeless people. Half their expenditure has to be met by voluntary donations. They not only help people sleeping rough- especially important with cold weather coming on – but run a day centre and residential projects to help people transform their lives. The generosity of parishioners enables us to ease in this way the burdens others are carrying. We hope supporters of the Parish Project approve of their committee’s choices. Contributions can be regular or occasional, and of any amount. All you have to do is take an envelope labelled Parish Project from the back of the Church and put your contribution in the collection plate. All contributions are anonymous. If you are a taxpayer your tax can be reclaimed if you write your church covenant number on the envelope. We continue to support this project in Natal helping supply necessities to children orphaned by AIDS. Two-thirds of the cash is spent on food, the rest on clothing and sending children to school. In 2003 the North Coast Courier newspaper set up an umbrella fund encompassing the local Christian churches to channel money to assist the weakest in society. The Aids pandemic has brought about an explosion in the number of orphaned children on the North Coast. In some districts of the north coast unemployment has reached chronic proportions. The result is that by the time the child becomes orphaned, deep poverty has already struck its dehumanising blow and child headed families struggle to exist. In the main the funds are used to support feeding schemes and food parcels for the vulnerable. It was evident to classroom teachers that many children were coming to school having eaten nothing. One teacher from the Anglican church approached her vicar who in turn made contact with the Orphan Fund. It was arranged for loaves to be delivered daily to the school where Grade 8 pupils prepare the sandwiches, later handed out by teachers. Shakaville’s United Reformed Church – 120 orphans/vulnerable children receive 6 meals every week. Pastor Simone’s wife Eunice runs this with very little help. Creche has 67 children and at lunch time about 70 older children arrive after school. For most this will be their only meal of the day. Runs crèche and feeding scheme for after school meals. Assists with school bus fees and shoes for children enabling them to go to school. Eagles View Church – a Zulu woman living on the edge of a municipal waste dump houses 22 children and feeds an additional ten each day. She and her husband give all their income to ‘parenting’ these orphans. She receives monthly food parcels from the local church and the Orphan Fund. There are no administrative costs with legal, accounting and banking services given free; organisational costs are borne by the North Coast Courier; with members of the committee who are representatives of the various churches and the editors of the Courier newspaper making no charges for their time or travelling costs. Local people provide most of the anonymous donations which make up the bulk of the Fund’s income. A lot of this money comes from people not affiliated to mainstream churches and it was particularly encouraging to see their belief in the total integrity of the Courier Orphan Fund. There was plenty of evidence of involvement of different communities helping each other: local Indian vegetable growers contacted the fund and asked how they could help supplying soup kitchens with their ingredients. Others have done their part.